Why Aren’t You Living Your Dream? Why Aren’t You Living Your Dream? So many people feel trapped in a 9-to-5 job. They don’t like what they’re doing, are uninspired and/or underpaid, and don’t think they are making a contribution to society. The problems go on. They may work long hours, have difficult relationships with their bosses or coworkers, and be disappointed by a lack of advancement. They don’t like what they do. Many of them have a dream to do something fulfilling, something that allows them to make their mark on the world and help people and society in a valuable way. This begs the question: Why aren’t they doing it? Clues are found in the story of Burt Munro from New Zealand, whose story is depicted in the 2005 film The World’s Fastest Indian. Burt is an older man, perhaps in his late 60s, who has a very limited income and suffers several health problems, including heart trouble, prostate trouble, and hearing loss. He has tinkered with his motorcycle for about 25 years, getting it to go faster and faster. Burt is a free spirit with a dream to travel from New Zealand to the Bonneville Salt Flats in Utah to compete in a race known as Speed Week. The story depicts the amazing circumstances through which Burt overcomes difficulties with finances, technicalities of race registration, bike problems, health problems, and more, to break the world’s speed record and return nine more years to the Utah Salt Flats. He goes faster every year and sets numerous records. Burt’s story seems miraculous and inspiring, yet little do we know … we are just as powerful as Burt. while so many other people are not? Step 1 — Know what the dream is — write it down. Step 2 — Visualize living the dream. Step 3 — Take action to realize the dream. Step 4 — Face every obstacle. Step 5 — Give 100 percent of ourselves to realizing our dream. Step 6 — Allow for the unexpected. Step 7 — Accept and embrace every failure as motivation for growth. The answer lies in release of limiting beliefs that hold you back. My dreams are impossible to realize. No one believes my dream is possible, so I lose faith in myself. I try to please others by doing what they want me to do, instead of realizing my dream. My dream is too preposterous to realize. I don’t trust that obstacles can be overcome. Miracles are for other people. These are just a few examples and there are many more. Where did these limiting beliefs come from? Research has shown that the vast majority, up to 85 percent, of our beliefs are formed in early childhood. The beliefs that hold us back result from experiences that were painful for us when we were young. So what can we do? We can reprogram our childhood experiences. At this point, the painful childhood memories on which our limiting beliefs are based are just held arbitrarily in the mind. They aren’t happening anymore — we just store the images in our heads. These images can be replaced with more pleasant ones … images that allow us to live our dreams, and the process is simple. The early experiences that need to be addressed are identified with muscle checking. We walk through that painful experience with a practitioner, honoring the emotions by stating them out loud, and identifying the beliefs that were formed based on the experience. Then we decide what image we wish we were storing instead — what do we wish had happened? We can replace the image and beliefs that have been holding us back with those of what we wish had happened instead. This process creates new neural pathways that allow for positive, joyful experiences and success. It’s simple, and fun, and the process often involves one or more modalities, including color therapy, movement, craniosacral contacts, and acupressure, just to name a few. In this way, we remove the subconscious barriers that hold us back and prevent us from living our dreams. For most of us, it’s a steady, iterative process that can be applied whenever required as we move along the path from our current state to the manifestation of our dreams. Whatever difficulties arise, we remember that our thoughts create our reality. Therefore we realize that our difficulties are like traffic signs and arrows pointing us toward the inner work that needs to happen. As such, we welcome them and their guidance, work on early experiences, and create neural pathways that support manifestation of our highest potential. Then, like Burt, we too can live our dreams. 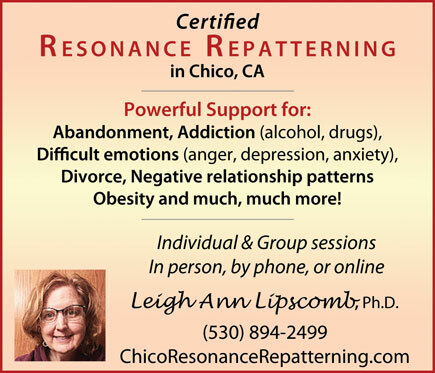 Leigh Ann Lipscomb is a certified resonance repatterning practitioner offering individual sessions and “Live Your Dream” workshops in Chico, CA. She can be reached at 530-894-2499 or chicoresonancerepatterning@gmail.com.